Turning chemical or other industrial facilities into bombs, with the potential for mass casualties. 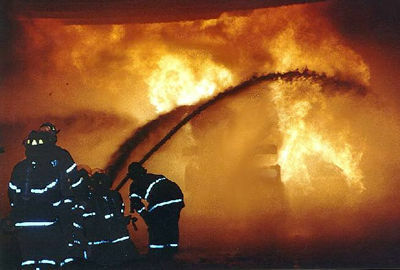 Explosive attacks on bulk fuel carriers or storage depots, including the risk of fratricidal explosions spreading damage to catastrophic levels. A substantial amount of attention has been given to the interest of Osama bin Laden’s al Qaeda, and other terrorist organizations, in obtaining and using chemical weapons, and analyzing the likelihood of it acquiring such weapons.39 But experts have warned also of the threat of another type of attack, similar in concept to using commercial aircraft as bombs—turning hazardous industrial facilities themselves into chemical weapons. The threat of this type of engineered chemical attack is so serious that many federal agencies have within recent days removed data about hazardous locations from their Internet web sites.45 What must also be asked is: what kind of weapons would be ideal for such attacks? Foreign and domestic terrorists alike have already considered such schemes. 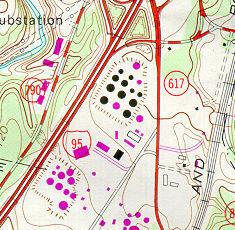 For example, members of the Ku Klux Klan plotted to bomb a hydrogen sulfide tank at a refinery near Dallas in 1997.48 According to the chief of the FBI’s domestic terrorist section, they discussed the potential of hundreds of deaths, including children, which they hoped to use as a diversion for a planned armored car robbery.49 The plot was foiled because an informant tipped off authorities, but the potential is nonetheless instructive. U.S. military manuals and manufacturer advertising identify bulk fuel storage as intended targets of 50 caliber anti-materiel sniper rifles. 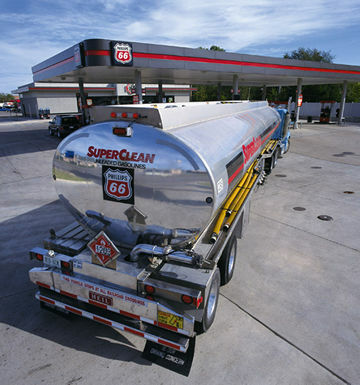 The first tank farm below illustrates a collateral hazard—it is within yards of a major interstate highway. The second fuel tank farm below illustrates a similar collateral hazard—it is located next to a shopping mall and commercial strip in a residential suburb of a major East Coast city. Attacks with armor-piercing ammunition on similar sites storing toxic chemicals could endanger tens of thousands of nearby inhabitants. The threat of an engineered chemical disaster is clearly real. How capable the country is of responding to such a threat is another open question—in 2000, Congress instructed the Justice Department to study how well chemical plants are prepared to prevent terrorist attacks, but did not fund the study.50 Chemical facilities were put on alert after the September 11 attacks.51But, the question is, what likely means of attack are they on the alert for? It takes little imagination to understand the threat from a 50 caliber sniper rifle firing a dramatically explosive and incendiary round like the Raufoss MP from a distance of several thousand yards (or even more, since the target is likely to be big enough to be hit at the farthest manageable range). Bulk storage of hazardous chemicals and fuels, and their transportation in bulk by truck and rail networks, presents many other targets for catastrophic attack by terrorists armed with 50 caliber sniper rifles and the armor-piercing, incendiary, and explosive ammunition widely available for them. In addition to the direct effects of explosions or contamination such attacks would cause, collateral effects could be shutdowns and massive dislocations throughout surface transportation and communications networks, and other vital parts of the critical infrastructure. This is not conjecture. Terrorists in the United States have plotted assaults on such facilities. Disastrous accidents involving bulk storage and bulk transport of hazardous materials have shown the potential consequences of a terrorist attack. The potential effects of a carefully planned attack could go far beyond the random effects of an accident. It is worth noting that 50 caliber enthusiasts trade tips over the Internet about the best ways to shoot commercially available propane tanks to cause them to explode. What is missing is an official response tying these strands together. 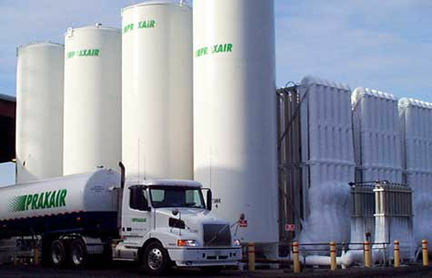 Attacks on liquid oxygen in bulk storage or being transported by tank trucks, as illustrated here, or on railcars could have explosive consequences. A well-planned attack on a location near key infrastructure would have devastating collateral effects. Tens of thousands of fuel trucks travel on highways every day, vulnerable to attack by long-range 50 caliber incendiary ammunition. Unintentional fires have already had devastating effects on transportation networks. Deliberate attacks could be far worse. Terrorists have already targeted bulk transporters. In 2000, for example, two anarchists in Oregon tried to ignite a 12,000-gallon gasoline tanker, using a crude milk-jug bomb with a delayed igniter. The device failed, but police said it would have caused a catastrophic explosion had it succeeded.68 The consequences of a successful attack with armor-piercing incendiary rounds on such a bulk tanker, or a bulk storage facility, could be disastrous—even if the attackers were themselves incinerated in the resulting explosion. A successful attack with armor-piercing incendiary rounds on railcars or trucks carrying flammable or explosive cargo could create geometrically increasing ripple effects if the attack occurred at or near a crucial site, such as a key bridge or tunnel, a national security facility, or a hazardous industrial site. This issue is addressed in the next paragraphs. There are a variety of ways in which a successful attack by a terrorist exploiting the 50 caliber sniper rifle’s capabilities could cause widespread disruption involving critical infrastructures. These examples were accidents. It does not take a great deal of imagination to project the mentality of a terrorist, the range of the 50 caliber sniper rifle, and the incendiary effects of its ammunition to imagine carefully planned scenarios with even greater immediate and collateral effects. d) The critical infrastructure includes such things as water supply, military installations, utility companies, natural gas distribution, as well as electrical and communications networks.